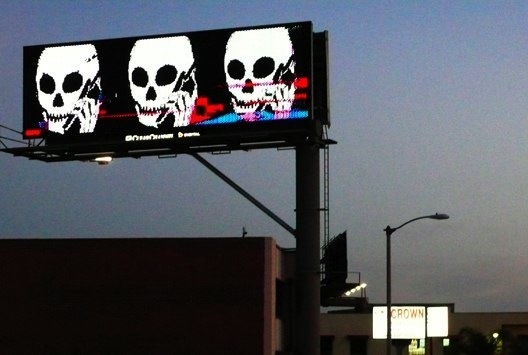 In case you haven’t seen the stunt spreading, meme-like, around the blogosphere, graffiti artist Skullphone hacked ten Los Angeles-area billboards owned by ClearChannel. It’s the coolest thing to happen to LA’s billboards since L.A. Story. And that was a movie, not real. See it on Skullphone and Curbed L.A. via Textually and Supertouch, and F.A.T. and Anti-Advertising Agency, via Gizmodo and MAKE. Now, this deserves special mention here because I imagine almost everyone here has dreamed of hijacking giant digital billboards — the way musicians dream of playing the Hollywood Bowl or being on the cover of Rolling Stone or something. Not that we condone such behavior, of course. No, that’d be illegal. Too bad you can only get away with stuff like this in LA and not, say, Times Square or Tokyo.